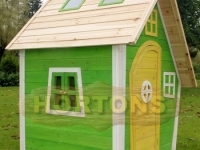 Playhouses and dens are such a wonderful playtime resource for children. Every family garden should have one. 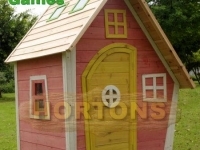 Our huge range of wooden outdoor playhouses offer something for every child, from girly pink-stained playhouses to tomboy play barns and whacky ranches. 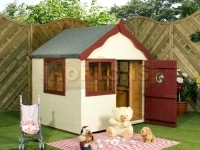 At UK Log Cabins we know how to create a wow-factor playhouse. Additional extras such as blackboard nameplates and window flower boxes come with some of our models and we offer many quirky designs and beautiful colours. 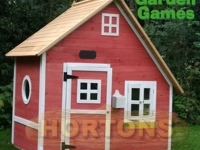 For larger gardens our activity centres combine a playhouse with swings and a slide. They are a great resource for offering children the chance for outdoor play when you don’t have time for a trip to the park. Our ultimate goal with all of our playhouses is fun. We want you and your children to safely enjoy years of imaginative play. 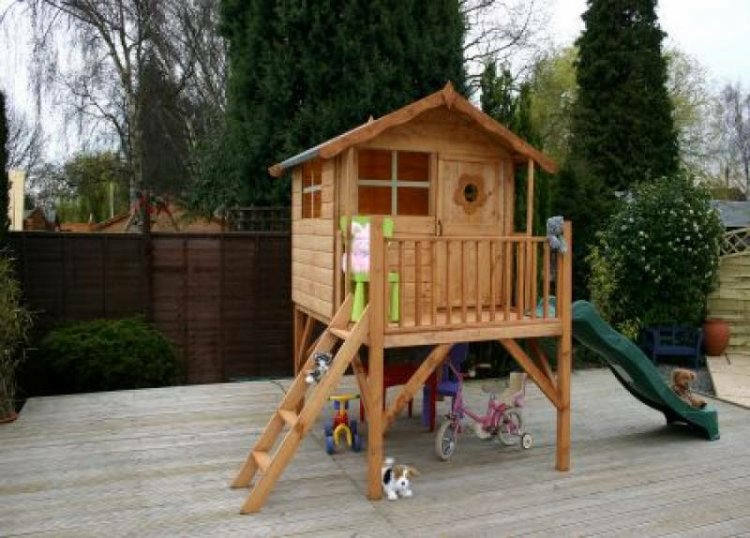 Our sturdy and safe wooden outdoor playhouses are exactly what we want them to be – a fabulous investment for years of fun. 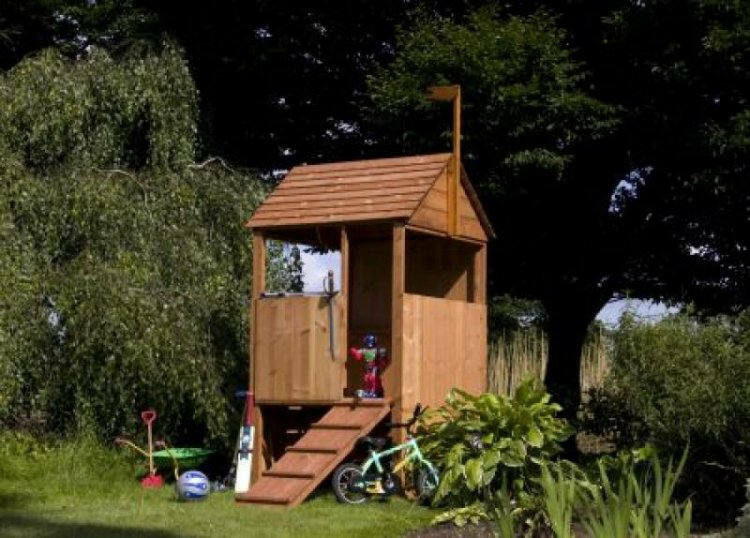 Perfect for hideaways and encouraging your child’s imagination, our playhouses are destined to become your child’s very own Treasure Island, space centre or superhero headquarters. 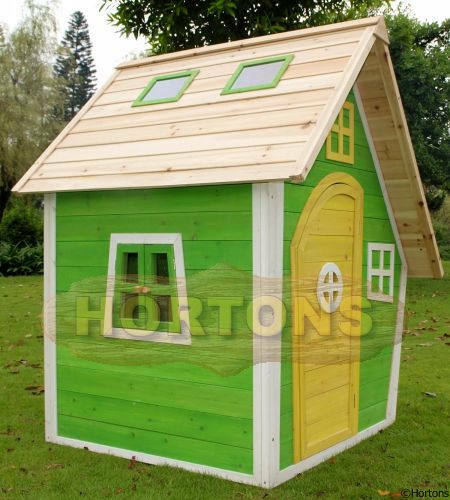 Our large playhouses with an upper dorm floor are just like a home from home for your children. 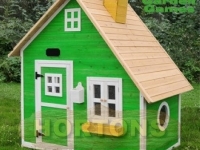 Hortons’ wooden outdoor playhouses come in a whole range of quirky designs, many with additional features. 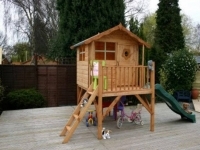 Choose from playhouses on stilts with slides, funky crooked houses, 2-storey playhouses and penthouses, plus many more. Quirky features include opening windows, porthole windows for keeping watch, cool verandas, naming blackboards, chimneys and we even have a design with upstairs dormer windows. 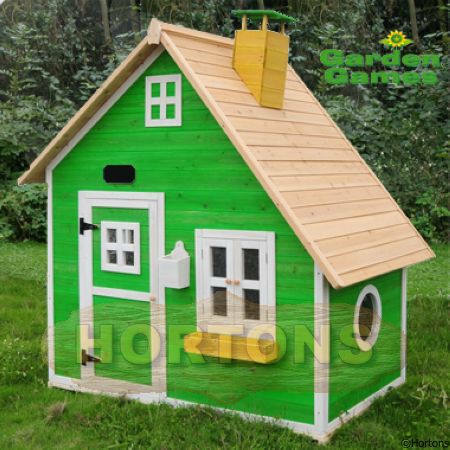 We offer both pre-painted or stained playhouses, and natural timber playhouses, so you can choose a quirky pre-painted colour, keep your playhouse in tune with nature or make the painting a part of your project in any colour or wood stain you choose. 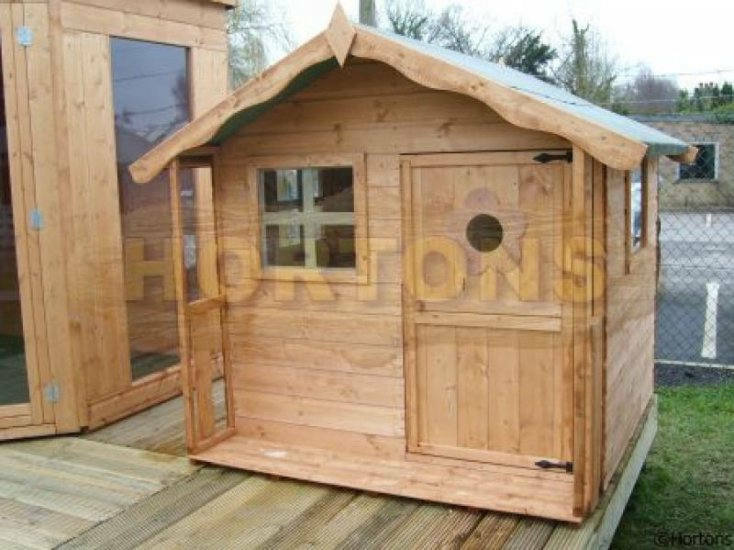 All of our playhouses are either pre-stained or pre-treated with a water based timber treatment for protection during transit. For non-stained models, in order to receive the full 10-year anti-rot guarantee, it is necessary that you treat the garden building with a high quality, spirit-based, timber preservative prior to or shortly after construction. This will protect the timber from weathering and will need to be repeated accordingly in relation to manufacturer’s instructions. We only use high quality timber from renewable sources. 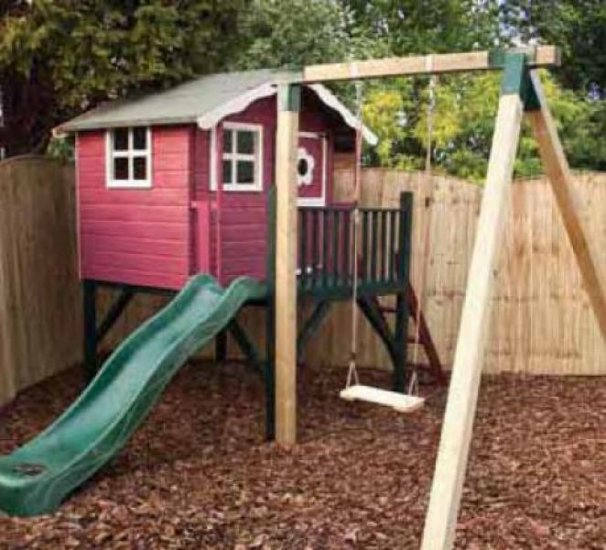 We are proud of our ethical footprint and our fine craftsmanship in creating exceptionally safe and sturdy playhouses. 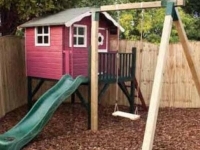 We take children’s safety very seriously, which is why our playhouses are all safety checked and approved by the TUV Safety Testing BS EN71 European Toy Standard. 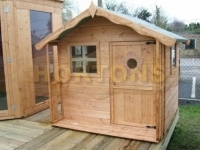 You couldn’t ask for a better “health-check” for the suitability of our wooden outdoor playhouses. All doors on our playhouses have safety hinges to keep your little ones fingers safe from injury, and magnetic catches keep doors and windows from blowing open on a windy day. Our styrene windows are a safe, shatterproof alternative to glass. 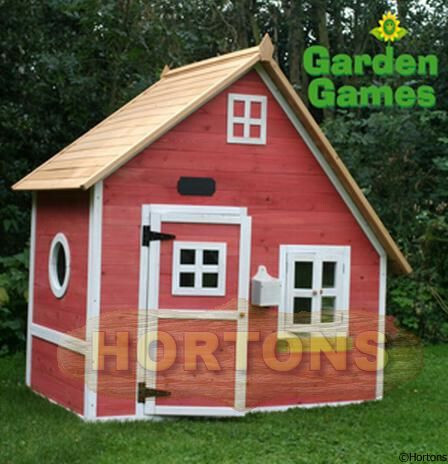 In addition, we’ve made sure the roofs and floors of all of our playhouses are sturdy and designed for secure, safe construction. All of our playhouses come flat-packed, but are incredibly easy to build. Just choose your spot in the garden and follow the instructions, then sit back and enjoy watching your children have hours of fun. 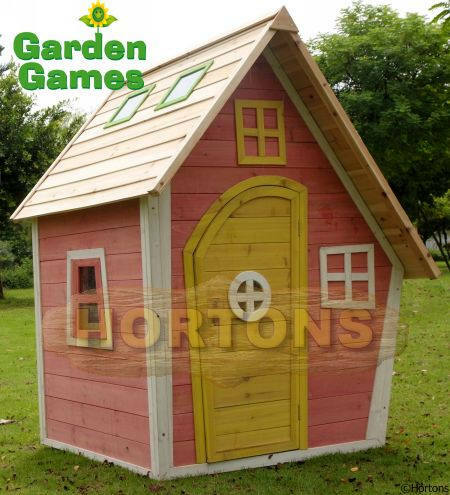 If you really don’t fancy putting your wooden playhouse together, we can do it all for you. Just select our installation service when you place your order (fees apply). 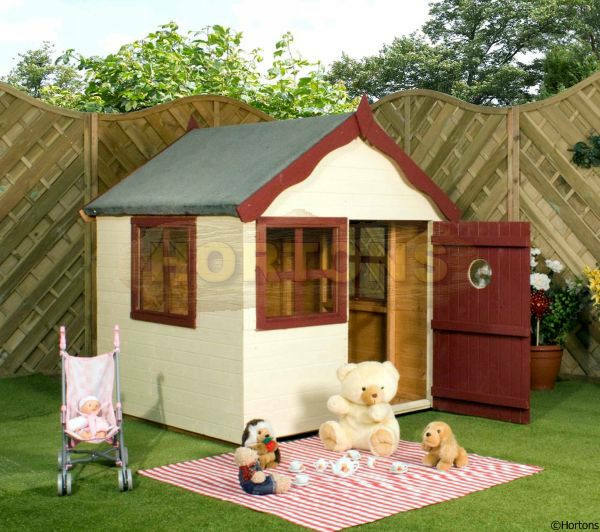 Contact us on 01293 822722 to order your favourite playhouse now or to find out more about our range. One of our professional, friendly team are waiting for your call and will help you with all of your queries. Alternatively, email us at sales@hortonsgroup.com or simply fill out the form below. Come and see us at our showground: The Log Cabin Showground, Handcross Road (B2110), Plummers Plain, Lower Beeding, Horsham, West Sussex, RH13 6NX. 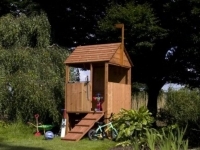 If you are keen to support your child’s imaginative play, one of our playhouses is a must in your garden. Why not give your little ones the adventure they deserve?